I'm so excited to be a guest blogger over at My Favorite Things!!! I had a blast creating with their products and I'm thrilled that I finally get to share them with you. One layer cards are a struggle for many card makers, even for clean and simple stampers like myself. If you keep a few tricks in your back pocket though you’ll be making one layer cards in no time at all! My best advice is to think creatively. “How can I add interest to a card without adding layers?” Masking! 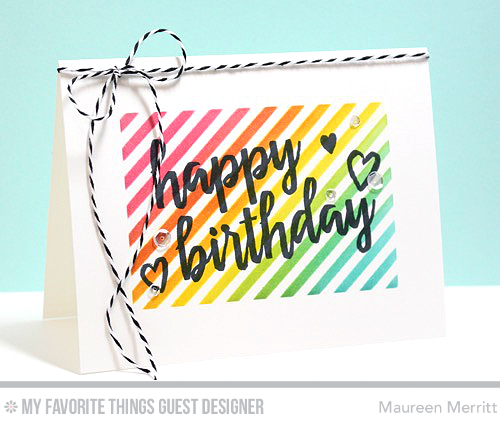 Masking is a great way to add interest without layers to a one layer card. And that is exactly what I’ve done on my card today. I began by masking off 3/4 of an inch on all sides of my card base. Then I placed the Diagonal Stripes stencil over top of the masked area, so it’s almost double masked. I used Distress inks to add color and what you are left with when all of the masking is removed is a bright and beautiful focal point. Now all I had to do is to stamp my birthday sentiment and hearts from Written in Watercolor. Simple accessories like twine and sequins are the perfect way to finish off a one layer card. See, look at that. Easy peasy! The next time you are challenged (or challenge yourself) to make a one layer card you will be able to whip one up in no time at all. Gorgeous! The card reminds me of your blog design!